Zodiac is committed to creating great products backed by friendly, responsive service to delight our loyal customers around the world.We believe, the key to that success is to offer quality products, affordable prices, quick delivery and top-tier customer service. 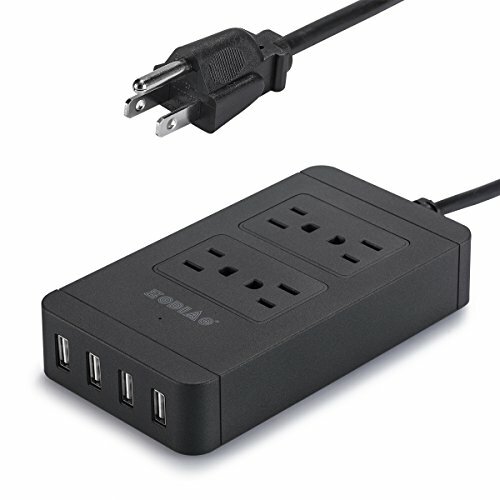 1.High-speed intelligent 4 USB ports(1.0A-2.4A) and 4 AC sockets(10A Max. ): Fast charging tablets and phones simultaneously. You don't have to worry about the outlet distribution for the maximum speed will be automatically varied according to the charging devices. 2.The Power Strip/outlet supports US standard plug. 3.The Power Strip supports high-power electrical device such as induction cooker, refrigerators, air conditioners etc. 4.It has anti-surge, overload protection. 5.Safer and More Durable: Better conductivity and thermal performance are ensured by inner copper conductor. 6.Adopting 0.75 standard square copper wire core, the wire will not turn soft even after long time use under 2500W high power. 7.Its housing is made of special high-strength fire-retardant material.